FILE PHOTO: Members of the Ku Klux Klan face counter-protesters as they rally in support of Confederate monuments in Charlottesville, Virginia, U.S. on July 8, 2017. The U.S. House of Representatives unanimously adopted the resolution, U.S. Representative Gerry Connolly, a Democrat from Virginia, said in a statement. The Senate approved the measure on Monday. “Tonight, the House of Representatives spoke in one unified voice to unequivocally condemn the shameful and hate-filled acts of violence carried out by the KKK (Ku Klux Klan), white nationalists, white supremacists and neo-Nazis in Charlottesville,” Connolly said. The joint resolution, passed with the support of both Republicans and Democrats, will go to Trump for his signature. Representatives for the White House did not respond immediately to an email seeking comment. 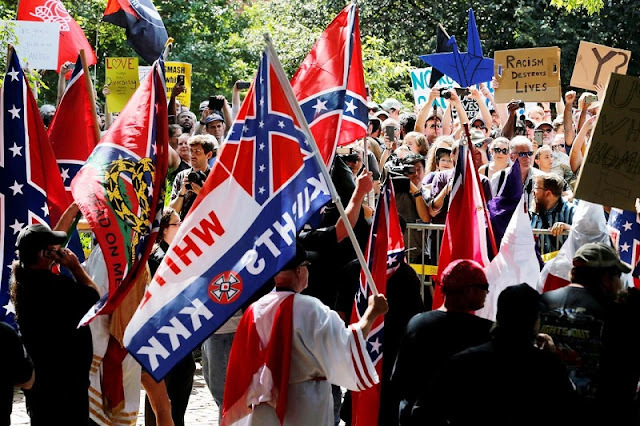 The Congressional resolution calls on Trump to condemn hate groups and what it describes as the growing prevalence of extremists who support anti-Semitism, xenophobia and white supremacy. It also urges Attorney General Jeff Sessions to investigate acts of violence and intimidation by white nationalists, neo-Nazis, the Ku Klux Klan and similar groups. Trump alienated fellow Republicans, corporate leaders and U.S. allies and rattled markets last month with comments about the violence in Charlottesville, where white nationalists and neo-Nazis clashed with anti-racism activists on Aug. 12. One woman, Heather Heyer, was killed and several people were wounded when a suspected white nationalist crashed his car into anti-racist demonstrators. The Congressional resolution calls Heyer’s death a “domestic terrorist attack.” James Alex Fields, a 20-year-old Ohio man who authorities say drove into Heyer and other protesters, has been charged with second-degree murder and other criminal counts. On Aug. 12, Trump denounced hatred and violence “on many sides,” a comment that drew sharp criticism from across the political spectrum for not condemning white nationalists. White nationalists had gathered in Charlottesville to protest against the planned removal of a statue of Robert E. Lee, who led the pro-slavery Confederacy’s army during the U.S. Civil War. Trump defended Confederate monuments last month. At a rally in Phoenix on Aug. 22, Trump accused television networks of ignoring his calls for unity in the aftermath of the violence in Charlottesville. The resolution also acknowledged the deaths of two Virginia State Police officers whose helicopter crashed as they patrolled the Charlottesville protest.